It was an incredible, emotional moment. Morris Goodman, speaking at the opening of the McGill Life Sciences Complex (LSC) on Sept. 18, had one last thing to say. It was not easy. It was the defining moment of a long-awaited ceremony that celebrated the culmination of many dreams and heralded a new era in medical research at McGill. Michelle Courchesne, Quebec’s Minister of Education, Recreation and Sport, was visibly moved by Goodman’s remarks and she departed from the text of her own speech to pay tribute to his message and to both the Goodman and Bellini families who contributed massively to bringing the new complex to fruition. “Mr. Goodman, I just want to tell you my strong belief that when you say that Canada opened doors for an immigrant and the son of an immigrant, I must say that today, in 2008, that’s the strongest message you’re giving to Quebec society. “What I felt this morning is that both of you, with your wives and children, you made that donation first with your hearts and your beliefs and that’s the only way to build a strong society with values, not only structure, not only money, but values,” she said. Courchesne, whose government contributed roughly $41 million to the project, noted how important the new complex will be in helping the University attract and retain the best researchers in the world. The LSC, the largest and most ambitious construction project in school history, is nothing if not monumental. Fittingly for a project that was conceived in the spirit of collaboration between the Faculties of Medicine and Science, the LSC will stand as a model of interdisciplinary research, bringing together the world’s leading scientists in a wide range of disciplines. The isolated silos of knowledge have been razed, replaced by a potent mix of talent and cutting-edge equipment gathered together in a single complex that will accelerate the process in which scientific discoveries are translated into innovative treatments and cures and improved patient care. This interdisciplinary approach to discovery was at the core of Francesco Bellini’s vision when he contributed $10 million to the project, which was first discussed seven years ago. “I would like professors from many disciplines to work together,” the pharmaceutical leader said at the opening. That way, “science will be more fruitful, more efficient. But discovery alone is not enough, he said, reminding those present of the need to be able to bring the fruits of discovery to market where they can be accessible to everyone. The way the complex will encourage scientists from different fields to work together also drew comment from Dr. Eliot Phillipson, President and CEO of the Canada Foundation for Innovation, which contributed more than $27 million toward the project. The LSC encompasses two new facilities, the Francesco Bellini Life Sciences Building and the Cancer Research Building, as well as the existing McIntyre Medical Sciences Building and the Stewart Biological Sciences Building. The newly named Rosalind and Morris Goodman Cancer Centre will be housed in both the Cancer Research Building and the McIntyre Medical Sciences Building. The facilities will act as a catalyst, providing a common roof under which some 60 principal investigators will work together in five biomedical fields: cancer, complex traits, chemical biology, developmental biology, and cell information systems. Add to that over 2,500 researchers, technical personnel, graduate students and postdoctoral fellows working side-by-side and you get one of the world’s premier research and teaching centres. Innovation doesn’t come cheaply, and without public and private support for the LSC – which cost more than $73 million in construction alone – the project never would have made it past the drafting table. In addition to the Bellini gift, the Morris and Rosalind Goodman Family Foundation also made a major donation, which will endow in perpetuity a chair for a world-class scholar devoted to cancer research, especially pulmonary cancer. 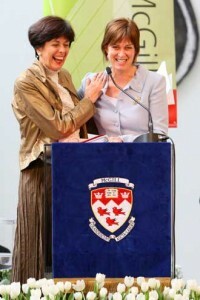 McGill Principal and Vice-Chancellor Heather Munroe-Blum described the significance of the opening event in glowing terms. “This is one of the most gratifying days since I became Principal of McGill,” she said. “Clearly, today is a day where we’re setting a new platform for extraordinary achievement and success. It’s a day when we celebrate our partners …. and the pioneering leadership of both Quebec and Canada in giving us a program and a platform that encourages talent to come and stay here in Quebec and Canada. We view this as our mission at McGill. As banners were unfurled in front of a striking mural depicting “cells and suns” to cheers and applause from the hundreds of invited guests, Dr. Richard Levin, Vice-Principal and Dean of Medicine, and Martin Grant, Dean of Science, declared the complex open. And Goodman, who also worked in the pharmaceutical sector, reminded those assembled that there should be more to a new building than steel and glass and concrete.